A rash under the arms can be unsightly, red and blotchy, itchy, irritating and uncomfortable, and sometimes smelly. The rash and symptoms might range from mild to severe, depending on the cause and how each person's skin reacts to it. You might get general relief from home remedies or need treatment with prescription medicines. Your underarm is vulnerable to the same rashes that can affect any other areas of skin on your body. However, your armpits may be more prone to certain types of rashes because of the increased glands and greater tendency to sweat in that area. The following are the common causes of rashes that can afflict your underarms. An allergic skin reaction or contact dermatitis is a common cause of a rash in your underarm skin. The flaky rash can be flat with fine pimples or raised with bumps or welts which can ooze. Frequent culprits that come into contact with underarms include deodorant or antiperspirant, soap, shaving gel or cream, perfume, powder, body spray, lotion, and detergent. Other allergens that can cause an allergic dermatitis in the armpits include poison ivy or an insect bite. Heat and moisture can cause friction and chafing in the underarms and cause a heat rash from inflamed or blocked sweat glands. This is a more common problem in warmer and humid weather and with frequent physical activities that cause sweating. 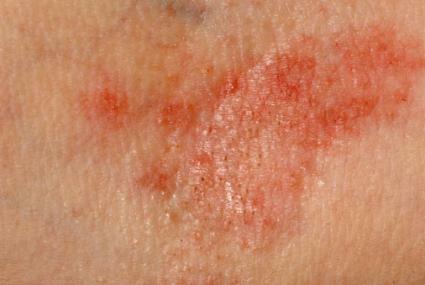 The rash is often pimply in appearance or may have small raised bumps. Shaving underarms can irritate and break the skin, causing redness and raised red bumps or razor burn. In addition, as the hairs grow back, the ends can turn and back into the skin as ingrown hairs, which can increase the irritation and rash. Shaving creams and waxing can also irritate the skin and cause a rash. Chemical, biologic and other agents in the workplace can affect exposed skin including the armpits. Occupation-induced rashes can be a contact allergic-type, inflammatory, or infectious reaction. Exposure to workplace agents can also worsen an existing rash of another cause. Examples of inciting agents that might come in contact with the armpits include paints, solvents, and tiny metal or insulation particles that become embedded in the skin. Eczema or atopic dermatitis is a skin condition many individuals suffer from. Eczema causes a recurrent, itchy, whitish or reddish rash. The afflicted skin can be very sensitive to other skin irritants. Common affected areas include the elbows and wrists, the neck, behind the knees, as well as the armpits. With the relentless itching of active eczema patches, the unavoidable scratching can cause the skin to ooze and crust. Inverse psoriasis tends to occur in body areas with folds and creases (intertriginous areas), such as the underarms, under the breasts, and in the groins. The itchy, red rash is usually smooth and shiny, unlike the scaly rash on other parts of the body, according to the National Psoriasis Foundation. 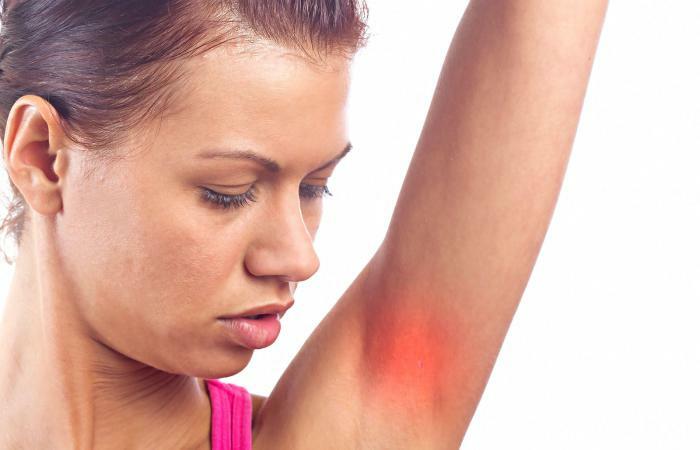 Bacteria such as staphylococcus can infect armpit skin and cause a rash with redness, itching, and an odor. Staph can cause an armpit eruption similar to acne on your face and lead to pustules and sometimes painful boils. The organisms can be present on towels, razors, bed linens, and other items and can invade the sweat glands or hair follicles (folliculitis) under the arms and other areas. A yeast infection, or candidiasis, is a common skin fungal infection that can affect of the underarm area and cause an inflamed, red, itchy, burning, and sometimes raised, scaly, smelly rash. The fungus and symptoms can worsen and persist if not treated. Candida loves to grow moist, warm, sweaty areas where folds of skin meet such as the armpits, the groin, and under the breasts, and the itching can be severe. 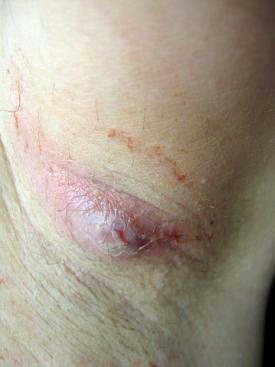 Another type of fungal infection, tinea or ringworm, can also cause similar underarm symptoms and a red ring-like rash. Some parasites that attach to human hosts, such as scabies, thrive in warm, moist areas such as the armpits. Scabies and other parasites cause severe itching and red pimply rash, bumps, or raised welts in the affected areas. Shingles is caused by a reactivation of the varicella-zoster, or chickenpox virus years after the initial infection. 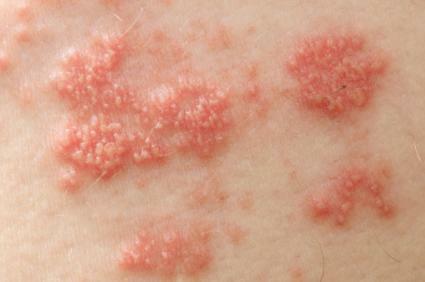 The shingles outbreak causes a painful patchy, red rash with scattered blisters which can break and crust over. The usually band-like rash usually involves a patch of skin on one side of the torso which can involve the armpit. Hidradenitis suppurativa is an extreme inflammatory painful, distressing skin condition whose cause is uncertain. It is most common areas of many sweat glands and hair follicles, such as the armpits, the female external genital areas, and the groin. 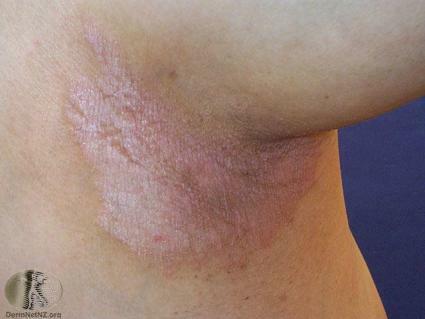 The rash includes skin abscesses which cause scarring during various stages of healing. Acanthosis nigricans is a dark, velvety pigmentation of skin that most commonly occurs in the armpits and other areas of fold and creases such as the neck, groins, and fingers. Symptoms can include itching and odor. Prediabetes, hormonal disorders such as polycystic ovarian syndrome, lymphoma and other cancers are some of the conditions associated with acanthosis nigricans. As noted for the individual rash types above, the appearance of the rash can vary depending on the cause and even from person to person. Symptoms may include redness, irritation, itching, or pain. The rash may be flat or raised, pimply or blotchy looking, appear as welts or hives, or just appear as a localized redness. An underarm rash can also be very mild and have few external symptoms. The first step in deciding how best to treat your armpit rash is to try to identify the cause. That might be difficult because the appearance and symptoms of many rashes can be similar. This Mayo Clinic symptoms and signs checker might help you narrow down the cause of your armpit rash. If your rash is mildly red and itchy, options for at-home remedies include the following. For a mild surface infection you can use an OTC antibiotic ointment such as Neosporin three to four times a day. Try applying aloe vera gel two to three times a day. Aloe vera has anti-fungal, anti-bacterial, and soothing properties. Keep the affected area clean, dry and cool. Cool or cold compresses three or four times a day can also give symptomatic relief. Wear cotton tops to absorb any sweat and avoid tight clothes that trap heat and sweat. You can apply a light dusting of cornstarch to help keep your armpits dry. Avoid activities that make you sweat a lot until the rash clears. If you think your rash is caused by yeast, you can try an OTC anti-fungal cream such as clotrimazole four times a day. Stop using the product to see if the rash and symptoms clear up. You can apply an anti-itch cream for symptomatic relief. Consider taking OTC Benadryl pills. but check with your doctor first to make sure you don't have a medical such as high blood pressure that puts you at risk if you take the product. You can try eliminating one product at a time, or if you can't pinpoint the culprit stop all new products and try reintroducing one at a time or switch to using mild hypoallergenic products. You are unsure of the cause of your rash. Your symptoms, such as redness, itching, or pain are severe and unbearable. The rash and symptoms persist or are getting worse after a week of home remedies. The rash appears to be an infection such as yeast, bacteria, parasites, or shingles for which you might need the right prescription-strength medicine. A rash that looks like eczema or psoriasis usually might need prescribed treatment such as Elidel, Protopic, stronger prescription steroid creams, and other recommendations by a doctor. Other interventions might include lancing of boils or laser treatment of a condition such as hydradenitis suppurativa. Acanthosis nigricans needs an evaluation to find the specific cause and treatment. Symptoms of a persistent or severe rash under your arms can be annoying and sometimes nerve-racking. Take steps to decrease the chance of those rashes you can control from appearing. Keep your armpits as dry as possible and free of tight, irritating clothes and harsh products, and don't share personal items. See your doctor for any concerns or additional treatment.